The Milwaukee County Zoo has acquired three speckled mousebirds, two females and one male, all from the Detroit Zoo. The male is 5 months old and one female is 9 months old, while the other female is almost 6 months old. All three are on public exhibit along with our 19-year-old male. Speckled mousebirds typically start producing chicks when they are about 1 ½ years old. Unlike most other birds, speckled mousebirds will sleep huddled up together – belly to belly – sometimes clustered tightly into a ball to keep warm at night. They are an acrobatic feeder, meaning they can feed while hanging upside down. We feed our speckled mousebirds pellets, fruit, vegetables and a variety of insects. 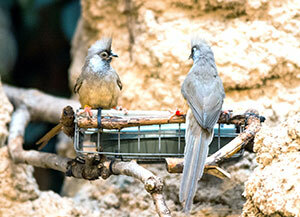 Although speckled mousebirds are native to Africa, you can visit them daily, in the Herb and Nada Mahler Family Aviary.